Ever wondered what it would be like to turn an existing playgroup into a Parent-Child Mother Goose program? Donna Windle and Jeanette Lord from Familylinks have been doing exactly that in the first half of 2018 — four times over, in fact. Our newsletter editor chatted with Donna recently about their experience. 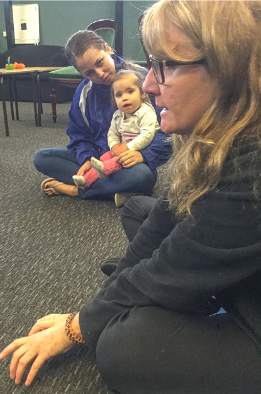 Mother Goose Update: Could you begin by telling us a little about your organisation Familylinks and about the kinds of programs you and Jeanette have been running? Donna Windle: Familylinks is a project of Growing Potential Ltd. and is funded by Mission Australia’s Communities for Children (C4C) partnership program. 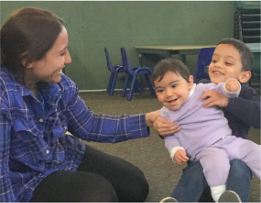 At the core, we provide free supported playgroups for children 0-6 years within five local Mount Druitt (Western Sydney) primary schools. We also run programs for school aged children and parents such as, DRUMBEAT, Circle of Security and 1-2-3 Magic & Emotion Coaching. 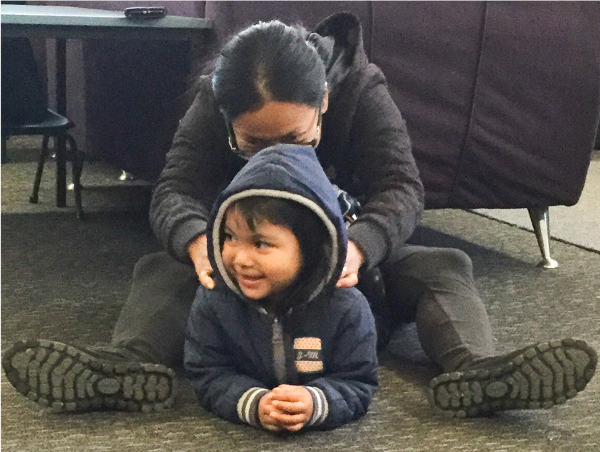 Mother Goose Update: How did you hear about Parent-Child Mother Goose, and what got you interested in starting your own programs? Donna Windle: To be honest, our interest was initially driven by funding needs, as we were required to deliver additional evidence-based programs. When we looked through a list of eligible programs, Jeanette and I came across Parent-Child Mother Goose, and we both thought "This sounds good – we could do that". Thankfully, training was relatively local and based in Campbelltown. Mother Goose Update: Rather than starting new groups from scratch, you decided to implant Parent-Child Mother Goose in your existing playgroups, so to speak. How did you go about this? For example, did you introduce elements of Parent-Child Mother Goose to your playgroup participants gradually? Donna Windle: Actually, no — we went with a "big bang" approach with one of our four playgroups and used that as our trial. We were quite honest with our playgroup parents. We explained that we needed to deliver additional evidence-based programs. Jeanette and I explained that we had had a good look at Parent-Child Mother Goose, and that we were genuinely enthusiastic about it. We provided parents with information about the benefits of Parent-Child Mother Goose and research behind the program. Within two or three weeks our families in that first group had adjusted really well. So, when the next term started, we were confident to incorporate Parent-Child Mother Goose in three more of our playgroups and we had a similar experience there. Mother Goose Update: As a matter of interest, in what physical settings are you running these programs? Donna Windle: Our settings vary throughout the week from school halls to school classrooms. Mother Goose Update: Do you apply eligibility criteria to interested families? How large are your groups? Donna Windle: All our groups are completely open — there are no eligibility restrictions beyond the children's age. We average around 10 to 15 children per session, and at times we have had more than 20 children, which can be somewhat challenging. Mother Goose Update: How do you begin the Parent-Child Mother Goose part of each session? Donna Windle: We were already using a "pack away" song in our playgroups ("We're going to pack, pack, pack away..."). Now we use that song as a signal that Parent-Child Mother Goose is about to start, and to pack away toys we've put out beforehand. Once the families come together, we sing "Sailing" and we're away. Mother Goose Update: You started running these programs only this year. What sort of feedback have you been getting so far from parents and caregivers? Donna Windle: Parents love the program. Many have told us how they're using "Sailing" as their bedtime song now. Just the other day a mother was telling me how her child had started doing the actions for "some snakes" on her mothers’ back when she was lying down. Mother Goose Update: What have been your observations about the program's benefits? Donna Windle: One of our goals for introducing Parent-Child Mother Goose was to promote parent-child attachment. We have found that parents are more engaged with their children during the program. We have provided them with helpful, practical ideas and it has empowered them to use elements of the program in their everyday lives. Children seem to respond well to the structure of a Parent-Child Mother Goose program. 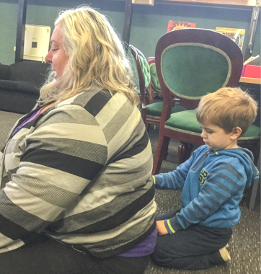 We have noticed the children are sitting and engaging in the program for longer periods. We have observed improvements in language development and their confidence to participate in singing. 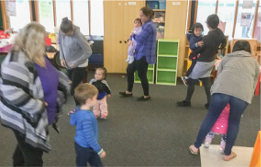 They are more likely to demonstrate and remember the actions to songs and rhymes and we are seeing growth and development each week in all age groups. Mother Goose Update: Introducing any new program is going to have its challenges. What have been the more challenging aspects of this change for you personally? Donna Windle: Not everything goes smoothly all the time! Boys who are ready for school next year can certainly bring a ‘This is for babies’ attitude with them and we have to be creative to ensure that we are engaging them in the program. As this is an open group we have new families enrolling all the time. Therefore, we are continually explaining the program to new people and settling children into the routine. This can be a major challenge for us. Initially, one of my own anxieties was around the storytelling component of the program. As this is a core part of the program, I knew I had to put my anxieties aside and just do it. I soon found that my confidence increased and I am now really enjoying telling stories. I have even started doing this within another program with school age children. Mother Goose Update: You're obviously a busy person. How do you and Jeanette find time to reflect on each session and plan the next one? Donna Windle: We always evaluate each session immediately afterwards. For session planning, however, we find it more practical to get together on a Friday and plan all our sessions for the next week at the same time. Mother Goose Update: One final question. How do you go about learning new songs? Donna Windle: That's not been a problem at all. There are lots of songs on the USB we were given at our training. Both Jeanette and I have been in the early childhood field for many years and are quite confident at making up our own lyrics when required. Mother Goose Update: Thank you Donna — and best wishes to you and Jeanette for your programs in the future.